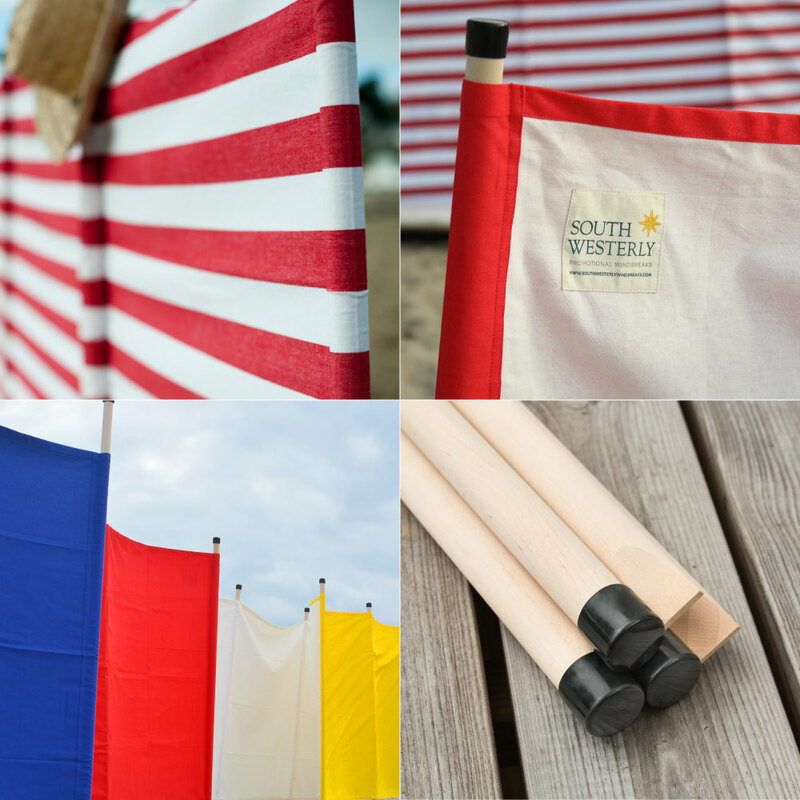 Manufactured to withstand the elements and heavy use, South Westerly Windbreaks and Deckchairs are not only functional, they also look great at the beach, in the garden or on a terrace. We are committed to maintaining excellent build quality and are very focused on our environmental impact by sourcing sustainable timber. All our products are made to strict ethical, ecological standards. We are inspired by our Cornish surroundings and insist that every one of our products not only has minimal impact on our natural environment during production, but are also designed to withstand our ever-changing weather conditions. Our aim is to create a perfect medium for businesses and individuals that are looking to stand out from the crowd, to proudly display their message to a wide audience, and rest assured that they have bought a quality product, built with love and attention to detail. All of our timber frames are made with sustainable, durable hardwood and finished with teak oil. 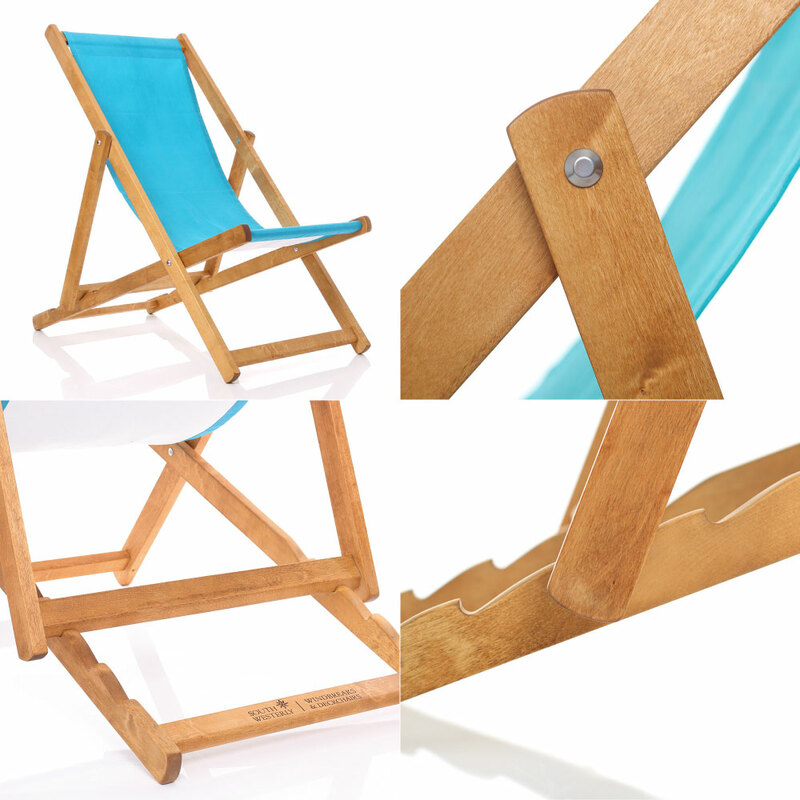 Our deckchairs have a noticeably more solid feel than most spindly, wobbly deckchairs. Our deckchairs are designed with longevity in mind. Their practical design means that all parts, fixings and fabric are replaceable, making your initial purchase a long-term investment. Our premium beautiful fabrics are a real eye-catcher to brighten up any location, made from high quality machine washable 10oz canvas cotton with UV protected inks. As one of the final five short-listed businesses in the Cornwall Sustainability Awards ‘Most Sustainable product’, South Westerly Windbreaks are made of 100% fair-trade cotton, with sustainably sourced wooden poles, and caps made from recycled rubber to protect the wood and support the windbreak. Our premium beautiful fabrics are a real eye-catcher to brighten up any location, made from high quality machine washable 10oz canvas cotton with UV protected inks, these products don’t just look great but are practical too. South Westerly Windbreaks are the must-have promotional items with the perfect amount of space to boldly present your logo, message, event or campaign. They are not only for the beach though, you could use your branded or individually designed windbreak at shows, music venues, garden parties, or anywhere that you want to shout about your product or service. With one of our windbreaks you can be sure that all eyes are on you! Find out more!